SPADO is the focal point for the International Campaign to Ban Landmines (ICBL) where we are conducting an annual research on landmines covering policy, mine action, stockpiles, use, casualties and victims assistance. 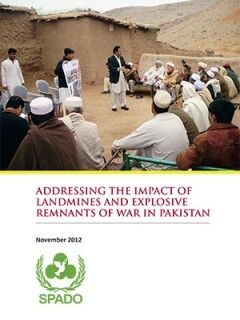 The report is published and released annually during the meetings of State parties to the Landmine Ban Convention. SPADO is also maintaining a research database of landmines and UXOs casualties mostly occurring in Pakistan. In 2012 SPADO conducted the first of its kind comprehensive research on the Impacts of Landmines and Explosive Remnants of War in Pakistan in partnership with Geneva Call. The study covered the background of the problem of landmines, casualties, mine risk education, mine action, support for victims of landmines and then provided relevant recommendations to the government, donors, NGOs and local communities. SPADO, in partnership with Geneva Call, carried out the first research of its kind on the impact of Landmines and Explosive Remnants of War in Pakistan. A major component of the research project was focused on FATA, as the casualties due to landmines and other explosive weapons have remained high in FATA. The field data was collected in all the tribal areas including key informant interviews and focus group discussions. The report was launched during the 12th meeting of State Parties to the Mine Ban Treaty in Geneva in September 2012 and later on launched and translated in local languages in Pakistan.